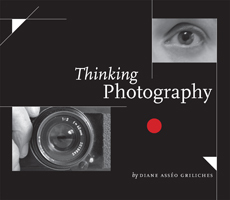 In Thinking Photography, Diane Asséo Griliches draws upon her knowledge as an experienced photographer to give readers an opportunity to learn—and enjoy—what can be accomplished with a camera. In an age when everyone uses a camera, the book offers a thoughtful approach to using it well. In her introduction, the author discusses the gift of science to this art, her particular love of the black-and-white-image, the varied attitudes of great photographers—revealed in a selection of lively quotations—and the fascinating history of photography leading up to today’s pixilated revolution. The heart of the book is a collection of 130 photographs made by the author over a period of thirty years, selected and annotated to illuminate the many aspects of the artform. Every image is accompanied by a concise text delving into the issues raised by that photograph. In some cases, these are technical, involving composition, exposure, shutter speed, focal lengths, lighting, depth of field, and contrast. With some the author may reveal “secrets” of the trade in going about her work to achieve a particular effect or to overcome a problem. In other images, the discussions revolve around elusive but important issues such as ethics, responsibility, and the interpersonal relations between photographer and subject. A fascinating and unusual part of the book involves thirty images made with alternative processes with which Griliches has experimented. Several of these date from the time of the early inventions of photography—platinum, albumen, salt, cyanotype, and Van Dyke prints. Other alternative photographic images include mordençage, photograms, solarization, infrared, collage, and hand painting. These were chosen to illustrate their different aesthetic effects. In this remarkable new book, a 130-image compendium of Griliches’s work, images function as a means to an end, mere reference points for an accompanying series of effusive, in-depth commentaries on photography’s history, techniques, and unique power. The book serves as a primer on the craft and art of picture taking for the enthusiastic amateur, with Griliches (An Appalachian Farmer’s Story) as a warm, gifted, hands-on guide. For example, she gamely shares the results of her experiments adding color by hand and employing alternative and historical printing techniques, elsewhere discussing her appreciation of the camera’s history and the constant contributions that science has made to its advancement. Her work is strong and some of the portraits striking: an elderly woman profiled arrestingly by darkness; a young girl reading on a Japanese train; the shoemaker in his shop. When Griliches’s prose and images fuse effortlessly, the book comes alive, as in her descriptions of a child touching a wall of water, a majestic tree in Israel’s Negev Desert, or an incipient storm on a farm in Portugal. Griliches’s gift—and the reader’s reward—is the degree of thoughtfulness and appreciation with which she imbues the subject of photography.